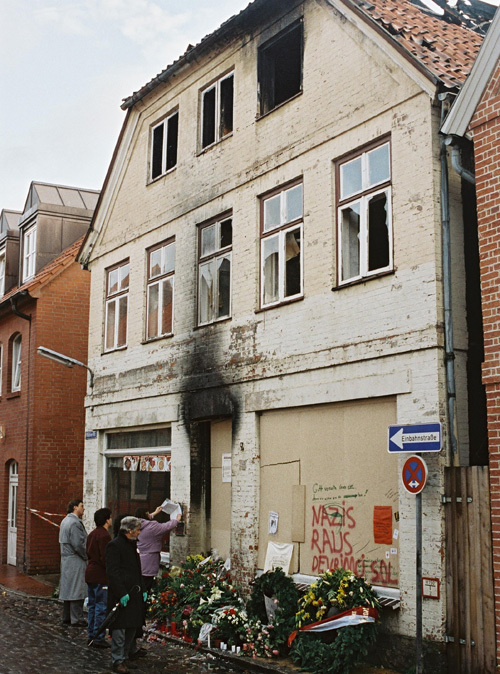 On the night of November 22, 1992, right-wing extremists set fire to two houses inhabited by Turkish families in the small town of Mölln in Schleswig-Holstein. Two girls and a 51-year-old woman died in the flames; nine others were seriously injured. The arson attack shocked the German public and prompted numerous demonstrations against xenophobia and right-wing radicalism in the following weeks. In this photo, shows citizens of Mölln commemorate the victims by laying flowers in front of the remains of one of the houses. The two perpetrators, a 19-year-old and a 25-year-old, were apprehended; in December 1993, they were sentenced to 10 years of juvenile detention and life imprisonment, respectively. Photo: Wolfram Venohr.